Even though he was born and raised in Milwaukee, Steve Miller took a long while to warm up on a frigid Saturday night at Mystic Lake Casino. Was it the weather? The fact that this was a one-off gig for a band that tours heavily in the summer and fall? Or was it that the newly streamlined Steve Miller Band has a different vibe? Miller, 65, did make a comment about hoping to return to Minnesota outdoors during mosquito season. He did mention that Norton Buffalo, his harmonica player for 34 years, died Oct. 30 after an unexpected case of lung cancer (he was a nonsmoker, his dad is 93 years old). What he didn't mention is that Minneapolis bassist Billy Peterson left the band last fall after 23 years. The leaner sound was effective on a batch of new blues and soul numbers drawn from an album due in May. 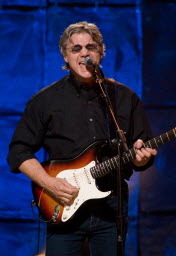 Most of the selections featured vocalist Sonny Charles, the newest member of the Steve Miller Band. He's a soulful singer, and his dancing in those two-tone shoes added much-needed flair to Miller's fairly colorless perrformance. By contrast, on some of the classic Miller tunes such as "Fly Like an Eagle," the sound was thin, the performance perfunctory. Miller perked up on a solo acoustic set, especially on the heartfelt "Wild Mountain Honey" that he dedicated to Buffalo. Miller stepped into fun mode late in the generous 125-minute set when he asked for requests -- and performed them. He played harmonica on "Livin in the USA," threw in a little "You Really Got Me" guitar riff on "Space Cowboy" and essayed a bit of "Going to the Country," which he said he hadn't played in 36 years.Then Miller closed with a full band rendition of "The Joker" (he'd played it solo acoustic earlier) and "Jet Airliner."